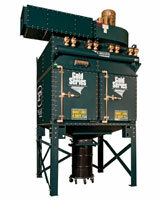 This revamped line of dust and fume collectors features a number of design changes and cosmetic enhancements. The Gold Series collector now has a reinforced door with double-thick hinges, easier-to-operate hardware and a single flat inside panel to create a smooth, air-tight gasketed seal. A taller inlet collar accommodates larger fans with adequate clearance.